Opposition head jokingly suggests that Netanyahu offer the Pope to run for president. Opposition leader MK Yitzchak Herzog (Labor) mocked Prime Minister Binyamin Netanyahu on Monday over his failure to endorse one of the candidates in the presidential election. Herzog jokingly said that Netanyahu, in an attempt to prevent MK Reuven Rivlin from being elected, should suggest that Pope Francis contend for the position. 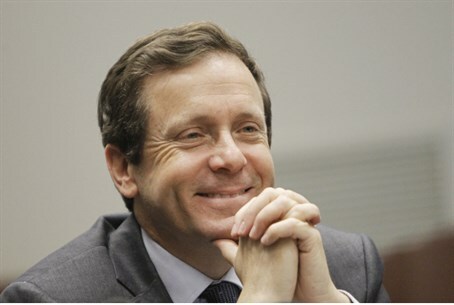 "The prime minister has totally lost control over the process of electing the next president," Herzog charged. "I guess the only one who hasn’t received an invitation to run for president is Pope Francis, and even this can happen before he leaves here,” he added. Herzog reiterated that the Labor party “fully” supports the candidacy of MK Binyamin Ben-Eliezer. Netanyahu has been reluctant to support Rivlin as the Likud’s official candidate for the presidency, given the bad blood between them. In fact, some have suggested Netanyahu has been making desperate maneuvers to try and prevent Rivlin from being elected. Some reports have suggested that Netanyahu may back former Knesset Speaker Dalia Itzik, who has been able to obtain the ten necessary signatures from Knesset Members in order to run in the presidential election. Sources close to Foreign Minister Avigdor Liberman recently hinted that the foreign minister is leaning towards Itzik because of their good connections, and because he doesn't want to see the post taken by Rivlin. Analysts say that if Netanyahu supports Itzik, Liberman will as well. In addition to Rivlin, Ben-Eliezer and Itzik, other candidates include MK Meir Sheetrit (Hatnua) and Nobel Laureate Professor Dan Shechtman.